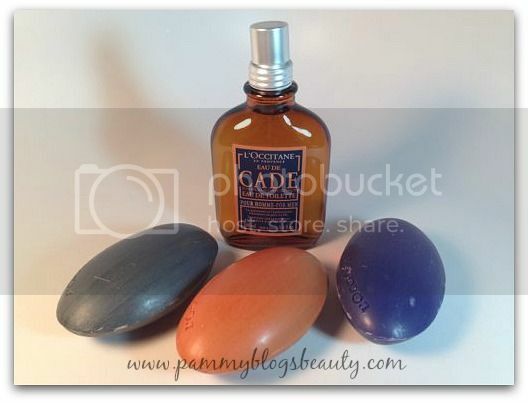 Pammy Blogs Beauty: Father's Day Gift Ideas from L'Occitane and Surface! Father's Day Gift Ideas from L'Occitane and Surface! Can you believe it is almost Father's Day? Time flies! It seems like it was Mother's Day just yesterday. ;) If you are like me, I am always scratching my head with what to get my Dad and Husband for Father's day. Even though both my Dad and Husband never ask for anything, I still always want to give them a gift in addition to setting up a fun day of family activities to celebrate. If you have a Dad in your life that enjoys luxury products, then I have some ideas for you. Pamper Dad with some high-end grooming products and fragrance from L'Occitane and Surface Men! To find out more about the new Surface Men line and the new Cade Collection from L'Occitane, please click "read more" below! My husband is very into wearing fragrance. So, I am always on the lookout for colognes for him for gifts. 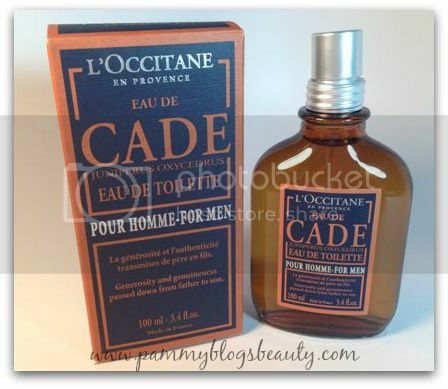 Both my husband and I really like this new Cade Eau de Toilette fragrance from L'Occitane. It just has a very "wearable" scent that works for everyday. While I am already a lover and fan of L'Occitane, this is my husband's first experience with the brand. He is very impressed with the Cade Collection and is interested in exploring the line further. Cade is a great scent for day or night. Plus, Cade works very well for the Summer season! An intense, luminous fragrance with crisp, outdoorsy notes that exude sheer masculinity in a flask-shaped bottle. Oh my, these smell sooooooo good! These soaps look beautiful, too. You could give these as a set or add a soap or two to some other L'Occitane products to create a great men's gift. My husband and I each have our own sink on our bathroom vanity and these look very nice sitting out on his area. Embrace the spirit and warmth of Cade (light brown), the energizing vigor of Verdon (Greyish Blue), or the fragrant, masculine scent of L’Occitan (purple) with these invigorating cleansing soaps uniquely designed to fit comfortably in a man’s hand. L'Occitane also has some gift sets available for Father's Day. While I did not try out any of the sets, I will still list them for you here. They look like really good deals! NEW! Cade Collection ($65): An earthy, aromatic blend of juniper, sandalwood and rosemary essential oils, this masculine collection is complete with all of the skincare staples a man needs. Includes: our outdoorsy, new! Cade Eau de Toilette, a refreshing Shower Gel, a cleansing Pebble Soap and a calming After Shave Balm. Luxury Shave Collection ($155): Joining forces with the luxury shaving accessories brand Plisson, this deluxe gift set embodies the expertise and traditions of master barbers. Features Cade Rich Shaving Cream, Plisson Shaving Brush and Plisson Razor. L’Occitan Collection ($65): Experience the fiery, aromatic blend of the L’Occitan scent instilled in an Eau de Toilette, Shaving Gel, Shower Gel and Pebble Soap. My husband has been testing out this new Surface Men line for the past few weeks so that I can share his thoughts with you! 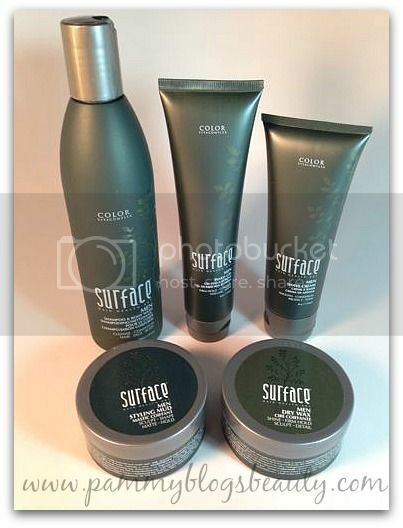 Surface Hair care, a brand known for products that are good for the scalp and the planet, recently released a line of hair care products for men. The line is directed at men who care about high quality performance as well as healthy, organic products. All of the products are made with natural ingredients like flax, amaranth, bamboo and aloe. It’s also gluten free! This is my husband's favorite product from the line. He really enjoys the scent! Plus, he expressed that he really does believe that body wash and shampoo should be just one product anyways. What can I say, men don't really have the specific "need" for a certain type of shampoo like we girls do, lol. ;) He justs wants something that smells good to clean his hair and body and this Shampoo and Body wash is working great for him! This product has mega hold. My husband expressed that it is actually a bit more hold than he needs. However, he can make it work if he uses very sparingly. My husband really likes the shaving cream. He said it is nice to use and better than his usual drugstore products. My husband uses this after washing and towel-drying his hair to give his thick and curly hair an extra bit of hold and shape. This product was a bit of a miss for my husband. He found it to be a bit too sticky and thought it was a bit hard to apply. However, it might work better for men with a different hair type than my husband. Have you done your Father's Day shopping yet? Anything special planned for the men in your life that day?